Standing in front of people is an intimidating thought. Whether it’s two or two-hundred, public speaking can strike fear into the heart of even the boldest extrovert. 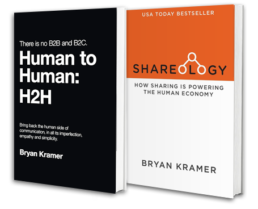 Bryan is one of the world’s foremost leaders in the art and science of sharing, and has been credited with instigating the #H2H human business movement in marketing and social. From keynotes to hosting, to interviewer to workshop trainer, he is one of the most versatile speakers out there. Although he comes off as cool, calm, and collected onstage, Bryan has experienced and overcome his own bout of stage fright. When he emerged from this tough time with a fear of speaking, he had a newfound appreciation for public speaking and unique insight on getting over this fear and getting on stage. Listen in as Bryan shares his tips for and tricks to bypassing fear and finding success on stage.